HONG KONG—On July 8, the Hong Kong Journalists Association (HKJA) published its 2007 annual report on the state of its freedom of speech. The report stated that although Hong Kong still enjoys basic freedom of speech, the scope of this freedom has apparently narrowed in the last ten years since Hong Kong was handed over to China; this was most apparent when reporting issues sensitive to the Chinese Communist regime. The report stressed that this has become a serious issue in the Hong Kong media only after the transfer of its sovereignty to mainland China. Mak Yin-Ting, HKJA member and co-author of the report titled “Squeezed Space,” said that the content of their findings covered the media output from last year, and also reflected changes over the last ten years. She indicated that the most concerning issue of last year specifically was the future of Hong Kong public radio. “Last year we saw that that the territory's government had put more pressure on the Hong Kong radio station,” explained Mak. “For example, the government established a committee to examine public broadcasting and they released a report determining the future of this service. The report mentioned that the current radio station, Hong Kong's public broadcasting service, would not be suitable in the future as a media organization. We don't think this is a reasonable arrangement.” Mak believes that only if this station were allowed to continue to run independent of the Hong Kong government, could it sufficiently serve its purpose. The report found that in the past ten years the space allowed for freedom of speech had apparently shrunken, especially when reporting on issues Beijing deemed sensitive. Interviewing individuals working in the Hong Kong media, a poll taken by HKJA in January of this year indicates that 58 percent of the respondents believe media freedom has gradually eroded in the last ten years due to self-censorship and the Hong Kong government's increasing control of the flow of information; 30 percent acknowledged personally participating in self-censorship; and 40 percent of the interviewees claimed that their colleagues engaged in self-censorship. Selecting Taiwan independence as an example, Mak pointed out that Qian Qichen, former minister of foreign affairs; Lu Ping, former director for the Hong Kong and Macao Affairs Office; and Wang Fengchao, the associate director of Liaison Office of the Central Government in the HKSAR, have all stated that Hong Kong media can't be treated the same way as other media. As for Falun Gong, since the Chinese Communist regime has a decided stance on the group, it puts pressure on those who report on it. The consequence is that less and less news regarding Falun Gong is being reported. 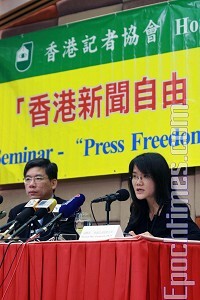 Mak stressed that HKJA opposed this media control from high- ranking officials. She believes that any relevant news should be reported as long as it is presented in an objective and fair manner. Aside from the self-censorship the Hong Kong media employs, Mak notes that another reason the territory sees less press freedom is because the SAR government has become less open to releasing information. “The survey by HKJA indicates that over 30 percent of journalists think the present SAR government is less open than at the time of the handover,” says Mak. “More than 50 percent of journalists think the present SAR government implements tighter control of the press. And 53 percent of the general public believes the present press sees more influence from the SAR government. The survey indicated that the territory's present Chief Executive, Donald Tsang Yam-Kuen, has more tact in controlling the press than his predecessor, Tung Chee Hwa. The SAR government always releases information to the international press known to report on it favorably. Meanwhile, the SAR government forbids officials from disclosing any materials to the press, making it impossible to report in greater detail. “It is difficult for a journalist to pump out news by himself,” laments Mak. “Questions are always forwarded to newspaper offices, and you never know when these officials will reply. In most cases, the answers are unsubstantial. Their answers resemble those given on a garden tour. This shows how the SAR government has become more restrictive in releasing information to the public and how the government whitewashes itself. The government guides the media toward a favorable image of itself via various means.” Mak believes that the government's handling of the press ultimately impairs the general public's right to know. The report also referred to the seven Hong Kong media heads appointed by the Chinese Government, and that all of them are members of the Chinese People's Political Consultative Conference (CPPCC). They have influenced the Hong Kong media toward slanted reporting on sensitive topics.